WASHINGTON — Americans pulled back on buying cars, furniture and other goods in January, pushing retail sales down by 0.3 percent, the biggest decline in 11 months. The January decline, following no change in December, was the largest setback since a 0.5 percent fall in February of last year, the Commerce Department reported Wednesday. 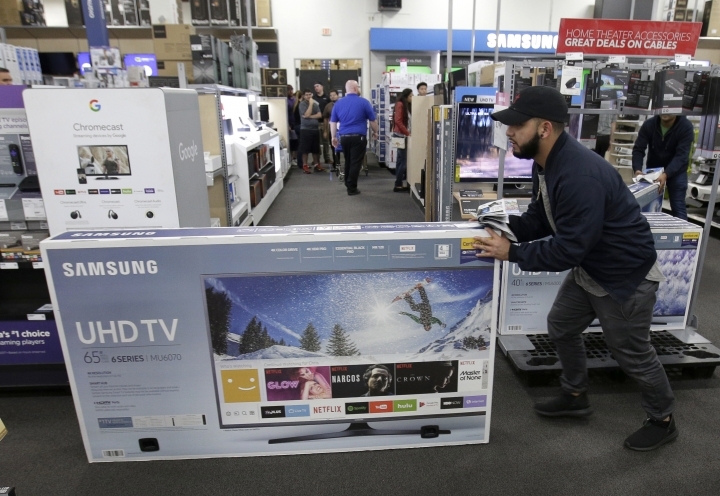 The slowdown comes after a three-month stretch of sizzling consumer activity, from September through November, which had fueled the most robust holiday sales in a decade. Economists were not too concerned, saying they continue to expect solid gains in coming months, as long as the recent stock market turmoil does not undermine consumer confidence. "Some of the weakness in January retail sales could be linked to the unusually high number of reported flu cases last month but, on balance, it was probably inevitable that sales would start to slow after their recent strength," said Andrew Hunter, U.S. economist for Capital Economics. "With jobs growth still strong, consumer confidence at an unusually high level and the recent tax cuts providing a one-off boost to disposable incomes this month, the near-term prospects for consumer spending remain fairly bright," Hunter said. Economists are forecasting that the overall economy will expand at a solid 3 percent rate in the current quarter. Auto sales fell 1.3 percent in January, the biggest monthly drop since August, and came on the heels of a smaller 0.1 percent setback in December. But the weakness was not confined to the auto sector. Excluding autos, retail sales would have been flat in January and a number of key sectors from furniture to building supplies suffered declines. Department store sales rose a solid 0.8 percent while a broader category that includes big box retail stores such as Walmart, rose a smaller 0.2 percent. The booming internet shopping sector was flat in January, but is still 10.2 percent higher than a year ago. Sales at gasoline service stations rose 1.6 percent, but that's partly due to rising pump prices. The overall economy, as measured by the gross domestic product, grew at a solid 2.6 percent annual rate in the final three months of last year. That followed two quarters in which growth had topped 3 percent. That was a significant improvement from modest annual growth rates of around 2 percent the U.S. experienced during the economic recovery, now in its ninth year. President Donald Trump insists that his economic program, which includes a $1.5 trillion tax cut, deregulation and increased infrastructure spending, will boost economic growth to 3 percent or better. The administration on Monday unveiled a $4.4 trillion budget for next year which shows that the tax cuts and higher government spending will result in $7 trillion in deficits over the next decade. That was double the estimate for deficits that Trump made in his first budget last year.